The International Concrete Polishing & Staining Conference and Expo is the only event of its kind specifically designed for concrete polishing professionals. This show offers 20+ conference sessions, an Exhibit Hall featuring polishing equipment and products, slab demonstrations and more. 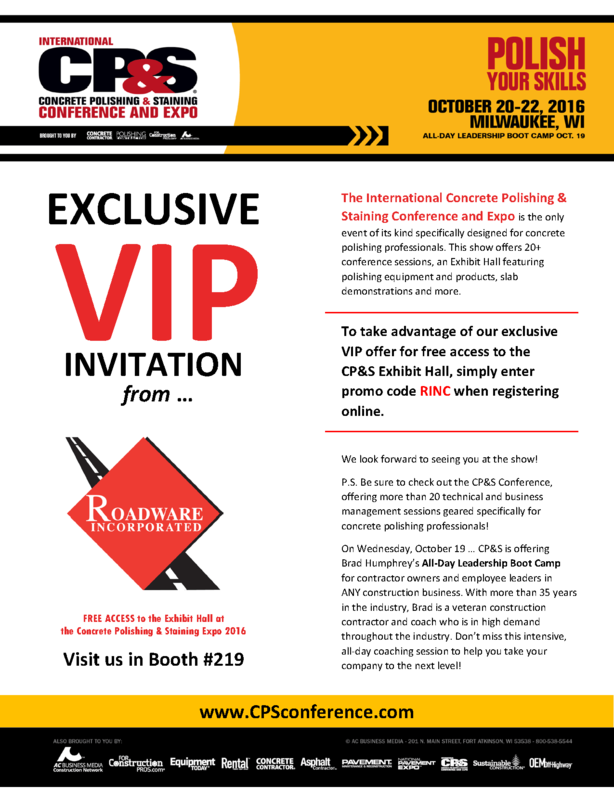 To take advantage of our exclusive VIP offer for free access to the CP&S Exhibit Hall, simply enter promo code RINC when registering online. We look forward to seeing you at the show! P.S. Be sure to check out the CP&S Conference, offering more than 20 technical and business management sessions geared specifically for concrete polishing professionals! On Wednesday, October 19 … CP&S is offering Brad Humphrey’s All-Day Leadership Boot Camp for contractor owners and employee leaders in ANY construction business. With more than 35 years in the industry, Brad is a veteran construction contractor and coach who is in high demand throughout the industry. Don’t miss this intensive, all-day coaching session to help you take your company to the next level!